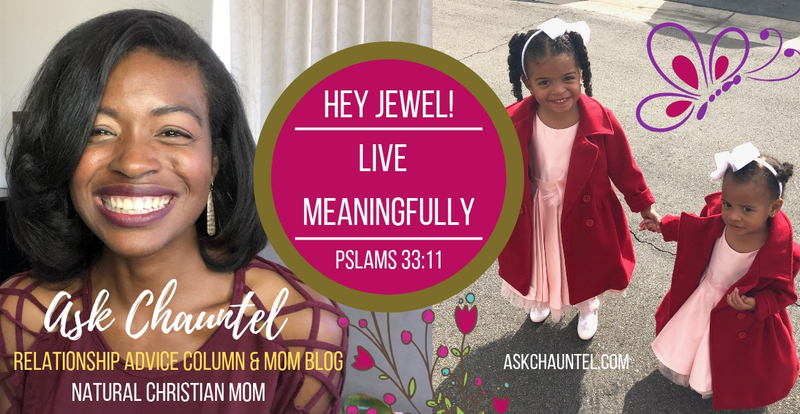 Ask Chauntel is one of the leading Advice Columns and Mom Blogs. I am a life coach and give Christian relationship advice, Christian marriage advice, parenting advice, Christian dating advice, and modest fashion tips. Also, you can experience my Natural Mom Blogs for mom and baby tips. If you are looking to find an advice columnist, or a Christian life Coach, I am here for you! You may submit a question for review and a possible response on the Advice Column in written or video form. Are you looking for private relationship coaching? You may sign-up for 1 of my 3 coaching options. These coaching options include Jewel Food, Email Coaching, and a 1-on-1 session, more info is available for you to sign-up below. If you want to live a meaningful and happy life, then you have to find peace within yourself. That perfect peace that you are seeking can only be found in God. Listen to this free audio devotional to gain a sense of how to find the peace within yourself so that you can overcome stress and begin to overcome the challenges that you will face in life. Savvy Social Jewels – by Ask Chauntel , was created to assist with our divine assignment to be apart of a community. When we share ideas and provide each other with support, then we are able to change and grow. There is nothing like a sisterhood of like minded women who can provide you with wise council. This group is made up of Christian women as well as girl bosses. We would be honored to have you apart. We mostly collaborate on Facebook, but there will be other opportunities for us to commune on other platforms. Become apart! It’s free! Email coaching is the best option if you want an affordable way to receive 1-on-1 coaching from Chauntel right to your inbox. You will have the opportunity to receive her practical, direct, inspirational, Christian advice and guidance. To see her coaching style in action, check out her blog which includes her advice column, mom blogs, and videos by clicking HERE. Ask Chauntel offers live 1-on-1 coaching to her clients who seek individual support virtually and via phone. Private coaching is the best option if you want to talk to Chauntel for live direct support. She will address your concerns and offer advice and guidance to help you in your specific situation. To see her coaching style in action, check out her blog which includes her advice column, mom blogs, and videos by clicking HERE. Read Ask Chauntel’s Advice Columns and mom blogs. Then, comment, give your advice, and/or vote on this week’s poll. Your fellow Jewels are excited to collaborate with you! Simply click comment beneath the post that you would like to respond to. If you don’t already have one, be sure to quickly create a WordPress login with your personal email to start commenting! Let’s get into it! Chauntel loves the opportunity to help other’s around the world by answering their life and relationship questions. We appreciate your support so that we can continue creating content and offering these services to our readers and subscribers. If you would like to, feel free to make a donation to the advice column. Your contribution will help us to continue creating more of the content that we produce. Donations are taken securely through PayPal. Feel free to sign-up to make a monthly donation or you may contribute a one-time donation to the advice column of any amount, at anytime! Thanks so much! Blessings your way, and click contact above for questions/concerns.